As we approach the new year, many of us are deciding on how we would like to better ourselves once 2017 arrives. New Year’s resolutions do not have to only involve ourselves, however; they don’t even have to involve humans. 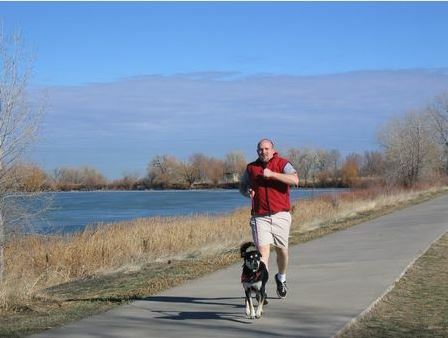 All dog owners can opt to exercise more with your dog after ringing in the new year. According to PetMD, 50 percent of dogs in the United States are considered overweight, and many people in the U.S. are as well. Dogs and people alike are also driven by routine. For health and wellness resolutions it is always helpful to have an accountability buddy – and no one ever said that buddy can’t have fur and four legs! We usually are very mindful of how much we eat, especially if we’re trying to lose weight. It is necessary to do the same thing for your dog, too. Using an 8 ounce cup, you can precisely measure out how much dog food you feed your pup every time. Follow the instructions on the back of the bag of food to get the exact measurements and portion sizes that are recommended. It’s also important to keep in mind that there are specially formulated blends of dog chow that are designed for dogs at different stages in their lives. For example, some dog foods are meant for older dogs and include ingredients meant to treat joint conditions. Others are meant for puppies and have a higher calorie count and include more of the nutrients young dogs need to grow. Be sure to feed your furry friend age-appropriate foods and both you and your dog will be much happier. Staying active is a big part of losing weight and keeping the pounds off. The same is true for your dog. In the new year, consider engaging in a new physical activity with your pet. This could be hiking, walking through the park or any other sort of outdoor hobby. Not only are many of these fun and a great way to get fresh air and bond with nature, but also wonderful exercise. Stay fit and strengthen the bond with your beloved pet all the same time! If these healthy activities sound like something you want for yourself in the new year, but you lack the dog to go along with them, Pauley’s Pups has you covered. We have a number of exceptionally cute, small-breed puppies that are wonderful additions to any home. We have many small mixed breeds including puggles, Yorkie-poos and teddy bears as well as purebred dogs like Pomeranians, Yorkies, Malteses and Chihuahuas. For more information about our available puppies or for help finding the right pup for you, call Pauley’s Pups at 804-798-7877 or stop in and see us in Ashland, Virginia today.